To Cite: Hajebi A, Ahmadzad-Asl M, Davoudi F, Ghayyomi R. Trend of Suicide in Iran During 2009 to 2012: Epidemiological Evidences from National Suicide Registration, Iran J Psychiatry Behav Sci. 2016 ; 10(4):e4398. doi: 10.17795/ijpbs-4398. Background: Suicide behaviors cause a large portion of Disability adjusted life years worldwide. Objectives: The aim of this research was to study the trend, correlations and discrepancy of registered suicide incidents in Iran from 2009 to 2012 using data from the Iranian suicide registry. Materials and Methods: Suicide registry entries throughout the country between 2009 and 2012, including suicidal attempts and suicides, were collected. Data on age, gender, occupational, marital and residential status along with suicide method, history of previous attempt and history of medical or mental disorders were registered by health service provision staff at the service centers. Geographic mapping and statistical analysis were performed. Results: Amongst the 252911 attempted suicides during the period, we found suicide attempt and suicide rate of 30.5 - 44.8 and 1.76 - 2.23 per 100000 individuals, respectively, denoting overall suicide fatality rate of 2.63%. The rate of suicide attempt in different provinces ranged between 0.7 and 271.1 and the rate of suicide between 0.17 and 17.7 per 100000 individuals. Attempted suicides showed more fatality in males, elderly, widow/widowers, divorced and unemployed subjects as well as in residents of rural areas. The most common attempt methods were medication overdose (84%), and the most common suicide methods were hanging (30.3%), medications overdose (28.1%) and self-burning (17.9%); these methods are found at different rates in various parts of the world. Conclusions: While the registry could provide us the most valid data on suicide, the wide range of suicide and suicide attempt rates in different provinces not only could question this statement but also could highlight the importance of studying the ethnic/geographic variations in suicide epidemiology with improved suicide registry and surveillance systems. Self and other inflicted injuries are amongst the first ten health burdens (1). Suicide behaviors including attempted suicide and completed suicide cause a large portion of Disability adjusted life years (DALY) worldwide as well as in Iran. Globally, suicide is the 13th cause of mortality; it is also 3rd ranked cause of death in the age group of 15 to 34 year olds (2). In Iran, suicidal behaviors and self-inflicted violence are responsible for 200 years of life lost (YLL) per 100000 individuals, and ranks as the fifth health condition regarding YLL (3). Reports on suicide from different countries and different regions in a country reveal discrepancies regarding demographic and methods of suicide (4). The frequency of suicide behavior methods as well as the fatality of each method and differences based on age, gender, relationship status and other demographic characteristics show differences not only between geographic and ethnic groups but also during different time periods (5). Therefore, the study of the characteristics of suicidal behaviors during consecutive time periods and comparing the determinants of suicide in different regions even in one country is necessary for understanding the underlying factors related to suicidal behaviors and also for planning evidence-based suicide prevention and control initiatives. There are several reports on suicide from Iran. Most of them are based on limited data from referral local health centers and there are also some limited data based on forensic medicine registry of suicides (6-10). All these reports lack investigation of all suicide behaviors as well as the ability to study the diversity of determinants of suicide in different regions. This study was based on the second report of the national registry of suicide behaviors in Iran and aimed to investigate suicide incidence rates during 2009 to 2012 and to delineate the discrepancies of the rates in different regions to help capture a more comprehensive view of suicide in Iran. Consideration of the challenges and limitations of the national registry along with natural diversities in suicide behaviors based on regional characteristics would help policy makers, scientists, clinicians and social workers to build their plans and concepts about suicide based on more realistic and accurate data derived from the national registry of suicide behaviors. This was a descriptive study of suicidal behaviors derived from the national registration system, which was designed by bureau for mental health office, ministry of health (BMH). The registration system was launched in March 2009 and all registered suicide behaviors were reported to BMH regularly every year. In Iran, universities of medical sciences and health services (UMSs) perform via their health network centres in each district, city or town. There were 42 UMSs in 2009 while the number increased based on revisions in national health system to 55 in 2013. There are 31 provinces, as different formal geographic regions in Iran, each with one or more UMSs. Assuming homogeneity of characteristics in a province we combined data from UMSs in each province to form provincial data of suicide. We gathered data based on the Persian calendar but to report them we corresponded each solar calendar year to most overlapping Christian year as such: April 2009-March 2010 to 2009; April 2010-March 2011 to 2010; April 2011-March 2012 to 2011 and April 2012-March 2013 to 2012.All detected suicide behaviors from hospitals, health centers and legal medicine centers had to be reported to registry centers in the health network of every district of the country and mental health officer would then collect the case registries and relay them to the correspondent mental health officers in UMSs of the area they were located. Finally all gathered data on suicide-inflicted cases would be sent to the BMH officer every year. The registration system and its characteristics is also reported elsewhere in more details (4). The data was collected from all aforementioned health services centers such as rural and urban health centres, general and mental hospitals and the death registration system using a paper-based questionnaire designed to report characteristics of suicide incidents referred to the centers. The questionnaire included the most important epidemiological variables necessary for developing suicide prevention and surveillance interventions such as source of data, date of incident, gender, age group, marital status, occupational status, educational level, past history of mental and/or physical illnesses, past history of attempted suicides, method of suicide, and also outcome (5). At each service center, there were trained responsible staffs of suicide registration present during all open hours. All data were collected on daily basis and posted to the officer of the health network of the catchment area in the district, town or city. The officers then entered the data on national suicide registry system and then sent them to the UMSs on a monthly basis. The collected data were reviewed by the officer in UMSs, and if they were acceptable regarding the requirements of suicide registration system, they were considered as the final registry and if not would be returned to the previous level to be revised and to be resubmitted after revision. Every year during April, the data from UMSs would be sent to BMH at the ministerial level to be combined and form the national suicide data. In this report, we used the data in the registration system from April 2009 to March 2013. Data analysis was conducted by IBM SPSS statistics for Windows, version 21.0 (IBM Corp., Armonk, NY). Descriptive results were presented by computing the mean, standard deviation and frequency. The incidence rate of attempted suicides and completed suicide was calculated by their total number divided by the population of each correspondent area (provinces, country) in the year of suicide incidents multiplied by 100000. 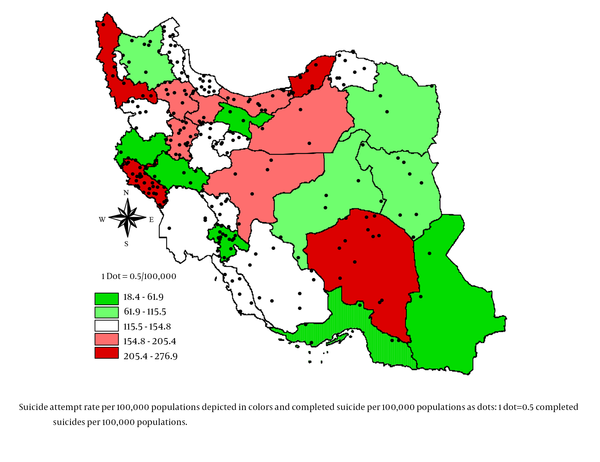 The population statistics were derived from the statistical centre of Iran (11). Logistic regression analysis was performed to develop a model of risk factors for completed suicide among attempted suicides. All aforementioned variables in registration system were used in the model considering entry level of P < 0.05 and removal level of P > 0.1. The data was also graphed according to the map of the country using Arcview GIS 3.2a (ESRI Inc., CA). During a four-year period we received reports of a total number of 252911 suicide incidents from 379 cities out of 405 cities that cover 96% of the total country’s population (11). During 2009 to 2013 the incidence rate of attempted suicides showed rather continuous increments from 53.6 to 100.1 per 100000 individuals and completed suicide from 1.76 to 2.23 per 100000 individuals (Table 1 and Figure 1). The ratio of attempted to completed suicide had increased from 30.5 in 2009 to 44.8 in 2012 (i.e. one completed suicide in every 30.5 attempts in 2009). About 20.4% (51347 subjects) of suicide events were reported from rural areas, where 38.2% of completed suicides (2538 subjects) were from. 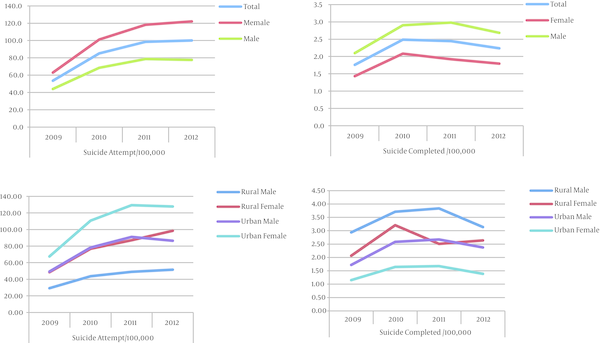 The highest suicide attempt rate was among urban female and male subjects in contrast to completed suicide rate, for which the highest rate was found in rural male and female subjects, respectively (Table 1 and Figure 1). The incidence rate of completed suicide in 31 provinces ranged from 0.17 per 100000 (Qazvin, 2011) to 17.67 per 100000 (Eelam, 2010) and the incidence rate of attempted suicide in 31 provinces ranged from 0.72 per 100000 (Qom, 2009) to 271.1 per 100000 (West Azarbaijan, 2012) (Table 2). Eelam 158.1 206.9 248.9 N.A. 13.5 17.7 12.9 N.A. 11.7 11.7 19.3 N.A. Yazd 70.2 96.2 107.5 26.5 2.9 2.0 1.3 N.A. 24.5 48.9 82.5 N.A. Lorestna 11.3 61.9 40.6 N.A. 0.2 2.4 2.2 N.A. 49.3 25.3 18.7 N.A. About 60.6% of attempted suicides and 41.0% of completed suicides were found in females. Female to male ratio in attempted and completed suicides were 1.54 and 0.69, respectively. The most common age among subjects with suicide behaviors were between 15 and 24 years old, which included 54.3% of attempted suicides and 41.4% of completed suicides. The fatality of suicide incidents (the ratio of completed to attempted suicides) showed an incremental trend from 2.7% and 2.0% in subjects 5 to 14 years old and 15 to 24 years old, respectively to 12.3% in subjects aged 65 years old or older. Regarding job status, homemakers had the highest share of attempted and completed suicides (33.7% and 25.2%, respectively). The most common method of attempted suicide by far from other methods was medications overdose (84.2%) while regarding completed suicide, the most common methods in suicidal deaths was hanging (30.3%) followed by medications overdose (28.1%) and self-burning (17.9%). Most of the subjects with suicidal behaviors were married and single (never married) individuals, but the fatality of suicide was highest in widows (12.7% in contrast to 6.2% in divorced, 2.5% in single and 2.6% in married subjects). Only 5.7% of subjects reported history of previous attempted suicides and only 2.2% and 6.5% reported history of medical and psychiatric illnesses. The relative risk for completed suicide was higher in those with history of psychiatric, medical illnesses and history of attempted suicides by about 2.13, 2.06 and 1.14 times, respectively (Table 3). Abbreviations: OR, unadjusted Odd ratio, aOR, adjusted odd ratio based on logistic regression model. aFatality rate is rate of completed to attempt suicide in each category. Amongst factors registered in the study, logistic regression model showed that gender, age group, marital status, region of residence and method of suicide would increase the odds of completed suicide among suicide incidents. Subjects within age groups of higher than 35 years old, male subjects and widow and divorced individuals, those residing in urban areas and those using hanging, self-burning and warm weapons showed higher probability of death if they attempted suicide (Table 3). Nationwide, suicide registry was started in Iran since 2002 (4) and promoted to established ongoing registry in 2009 (12). There is a wide range of registered suicidal behaviors in different regions of Iran that not only may show inherent discrepancy in the way people all around the country act but also may be an evidence of variations in registry of inflicted suicide subjects itself. The latter is of course a reflection of how people, including but not limited to registry staff in each sub-cultural area, may perceive, detect and report possible suicidal acts that obviously could include health center officials responsible in the registry (13). During the registry years, there was a significant increase in registry of suicide attempts in the country, including almost all provinces, in contrast to the fact that registration and detection of completed suicide incidents showed a rather stable course; this resulted in decremented rates of fatality of registered suicidal behaviors in Iran as the registry goes on. Despite the pattern we found at the country level, the pattern was not the same in all registry points and there were several provinces with raised reported suicide fatality i.e. proportional decrease in the rate of attempted suicide incidents and/or increase in the rate of death by suicide for example in Zanjan, Kordestan, Ardebil and Golestan provinces. Every suicide registry needs to note regional beliefs and behavior on disclosure of suicide incidents that may be related to inherent stigma as well as lack of benefit and poor care services people perceive they could receive by respect from community and health services. Malakouti el al. in a systematic review of suicide behaviors in Middle East reported the cumulative mean rate of committed suicide and suicidal attempts to be between 0.55 and 5.4 per 100000 individuals and between 0.72% and 4.2% in regional countries, respectively, and between 1.7 and 6.4 per 100000 and between 1.0% and 12.7%, respectively (14). Although provided statistics on suicide behaviors by the national suicide registration are somewhat far less than some highly cited epidemiological studies estimates (3, 15-18) and the systematic review on suicide behaviors in Iran, yet is the most comprehensive and only nationwide registry of suicide in Iran. Furthermore, we can hope that the development of this program in the future would provide more accurate estimates of suicide in Iran and we think that it could be a proper model for other countries especially in the Middle East where we share common cultural, regional and ethnical characteristics. By registration, it gives the health system the opportunity to study the course of suicide in inflicted subjects and to deliver necessary mental and social services for secondary and tertiary prevention of suicide, as well. This could be done by using data on suicide subjects at an individual level and by integrating the registry data and other information on service utilization in a systemic manner (19). The registry of more than a quarter of a million attempted suicides in Iran revealed that, similar to worldwide statistics, females had higher suicide and lower suicide mortality than males while in Iran the gender ratio (male to female) of attempts and completed suicides were about 3:2 and 2:3, respectively; males had an approximately 50% higher probability to die with a suicide attempt when compared to females, compared to worldwide reports of the ratio being 3:1 and 1:3, respectively, and about two hundred percent of completed suicide in men elsewhere (20-23). This indicates both low proportional attempts rate in females and higher fatality of suicide in females in Iran compared to global reports. According to several other reports, the most common age groups that performed 80% of attempted suicides were teens and youth between 15 and 35 years old while older age groups consisted of a smaller portion of the subjects yet showed higher fatality if they attempted suicide (20, 24). Increased fatality rate in older age groups highlights the importance of suicide prevention programs such as limited access to lethal poisons, medications and other tools (25, 26) but there is also a need to be alarmed that about 70% of deaths by suicide in Iran is among teens and youth (more than 40% in ages between 15 and 24 years old) that implies the importance of public mental health promotion programs specified for them to address this issue (27-30). Interestingly, there was a small, but significant number of suicides in children under 14 years old that may shed light of this less studied age group in suicide studies in Iran (31, 32). Our findings were also in line with epidemiological studies on suicide in clinical and community-based subjects from Iran and other countries regarding higher risk of suicide fatality measured in rural subjects. In Iran, about 70% of the population resides in urban areas (11) and regarding the rate of urban attempted suicides, there is a roughly even distribution of attempts in urban and rural areas according to population. Divorced and widow/widower marital status were also risk factors for increased suicide fatality (33-35). Having no job as a student, employee or homemaker were other risk factors of fatality in suicide incidents that may indicate the role of both social factors in choosing and acting on more fatal attempts and underline psychopathology that have an impact both on employment status and suicide vulnerability, simultaneously (13, 35, 36). Medications overdose was the method of choice to attempt suicide in 84% of subjects that is ranked second as the cause of the death by suicide after hanging, which was not only ranked first as cause of death by suicide but was the most lethal suicide method in Iran (5). Among the most important limitations of the registry in addition to wide discrepancy of registration results across the registration centers, was critically low reported psychiatric and medical comorbidity in attempted suicides. About 6% and 2% of registered subjects reported comorbid mental and physical health problems, respectively, that is less than about 23% prevalence rate of mental disorders in Iran (37) and also far less than reports indicating the rate of mental health problems in suicide incidents, up to 93% (38-40). This may be the result of registration system setup that have limitations in thorough psychiatric evaluation in all subjects and notably the stigma of having and reporting past mental health problems history as it is the case for suicide itself (41). Approximately 5% of subjects reported previous suicide history and as the registry system lacks the ability to identify suicide history because of personal identity privacy issues, this record also has the limitations mentioned for mental and physical illness history. We hope this study can highlight the importance of establishment and improving suicide registries in suicide prevention and surveillance programs and as indicated already there are several issues to consider when running and utilizing the registry data including cultural and stigma related factors, pattern of suicide methods prevalence and fatality in each area as well as other fatality risk factors involved in surveillance and prevention programs. Authors’ Contribution: All authors participated in designing the study. Ahmad Hajebi collected and interpreted the clinical data. Masoud Ahmadzad-Asl and Farnoush Davoudi participated in interpretation of clinical data, performed the statistical analysis and drafted the manuscript. Raoofeh Ghayyomi participated in clinical data collection. Ahmad Hajebi and Raoofeh Ghayyomi revised the manuscript critically for important intellectual content. All authors read and approved the final manuscript. Declaration of Interest: Authors declare no financial support and no conflict of interest that may have any impact on the content of the manuscript. 11. Population Tehran, Iran2013. Statistical Center of Iran. 2013.